There are numerous waterparks throughout the state of Michigan, offering a wide variety of water-filled fun and excitement through regular outdoor waterparks and indoor waterparks. With the many indoor waterparks in the state, residents and tourists alike can enjoy water slides, splashpads, wave pools, and much more anytime during the year. 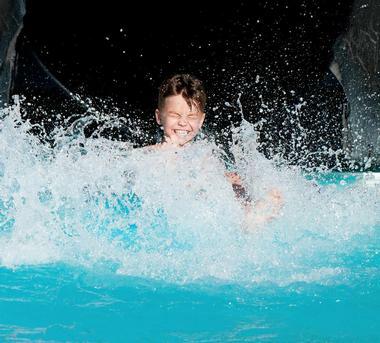 These waterparks provide something for nearly everyone, from water playgrounds for young children to lazy rivers to exhilarating water slides. Several of the parks, especially the indoor ones, also provide other attractions, dining, and accommodations. One of the country’s few indoor waterparks to offer two very different sections is Zehnder’s Splash Village, which even features a waterpark with a retractable roof. 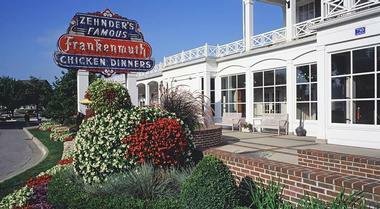 Zehnder’s consists of more than 50,000 square feet of water fun and is one of the largest indoor waterpark’s in the state of Michigan. 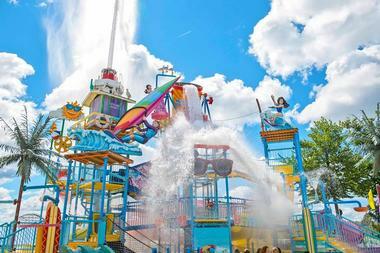 Guests can experience a super loop drop water slide, a six-story raft ride for the entire family, the Action River, the Dumping Bucket, a play area known as Splash Landing, a zero-entry pool full of activities, a lazy river, and tube slides measuring four stories along with several other attractions. Great Wolf Lodge in Traverse City, Michigan, offers affordable family fun that doesn’t hurt the family budget. 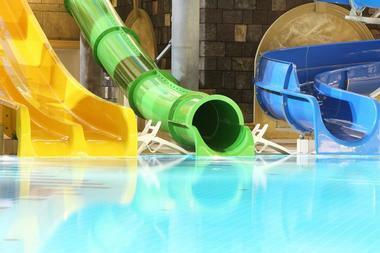 The resort and indoor waterpark boasts that it offers the best value for family entertainment. 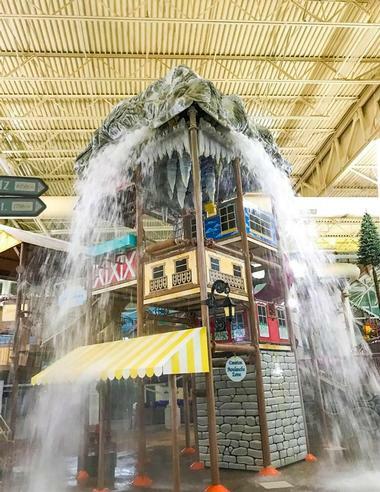 Among the many water attractions, the indoor waterpark includes several water slides, such as the River Canyon Run, Alberta Falls, and Totem Falls. There is also a water fort tree house, and the Whooping Hollow designed for younger guests. The Manitoba Tubs offer a relaxing soak in warm water. In addition to the large indoor waterpark, Great Wolf Lodge features options for dining, shopping, and other attractions. Avalanche Bay is 88,000 square feet of crazy water-filled family fun. The indoor waterpark is the largest of its kind in the state of Michigan, offering guests massive amounts of fun with water for people of all ages. The waterpark is conveniently situated in the center of Boyne Mountain Resort, and the “wet and wild” park is a constant 84°F degrees, allowing guests to enjoy all of the water fun year round. The latest and most thrilling new attraction at Avalanche Bay is the Big Couloir. Riders start out in a launch capsule that is angled 10 degrees from vertical for a really steep drop. Guests of the Soaring Eagle Waterpark and Hotel can start their water-filled fun by sliding through Loon’s Loop, the park’s three-story water slide, as they are sent turning and twisting at rapid speeds aboard inner tubes. Riders are then spun in a 360-degree bowl before dropping into the Little Beaver’s Bend River. Makwa’s Mountain, another attraction at the waterpark, is anything but a typical rock climbing wall. The wall is heart-pounding, helmet-free, harness-free excitement. Visitors ascend the giant wall to 8 feet above the park’s deepest pool. From the top it is a free-fall back into the deep pool. 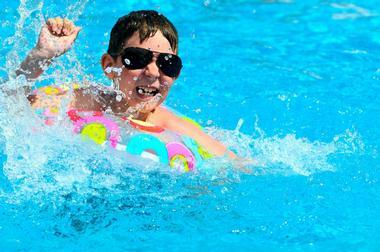 Red Oaks Waterpark offers plenty of water fun for children of all ages. Children especially love the waterpark’s Soak Station, a water playground designed for kids, including 68 fun features like a 8-foot tipping water-filled bucket, bubbler jets, slides and curtains, and water jets. The Spray and Play area is geared towards younger children and features bubblers and water jets at a depth of zero. Guests of all ages can grab an inner tube and float down the 990-foot moving River Ride. Other attractions at Red Oaks Waterpark include the Terrific Tides wave pool and the Triple Turn water slide. 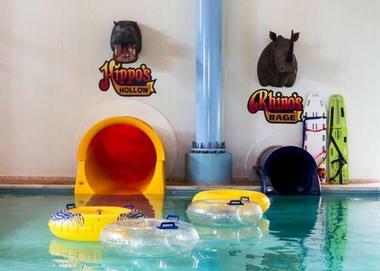 Surfari Joe's Indoor Wilderness Water Park features 18,000 square feet of water-filled excitement for the whole family. Visitors can whirl and twirl down two extreme water slides that funnel their way outside of the waterpark before landing riders back indoors with a huge splash. The Zambezi River Run offers a relaxing and enjoyable ride, while Lino’s Lagoon provides the perfect place for swimming. Younger children will love the Pygmy Pond Play Place with a dumping bucket, slides, and much more. There is also the Rip Curl Arcade for some non-water fun, and the Water Hole Grill provides an array of refreshments. Michigan’s Adventure is the largest amusement park, as well as waterpark, in the state of Michigan. The amusement part features seven different roller coasters, such as the Thunderhawk and the Shivering Timbers. The Wild Water Adventure waterpark has 15 different water attractions and is the state’s largest outdoor waterpark. Guest can have their own beach party with a drenching bucket, water wheels, water slides, spray guns, and more. Half Pint Paradise is a splash pad and slide attraction for younger guests and their families. 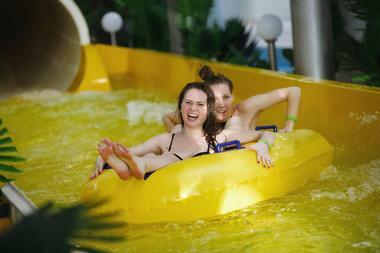 The waterpark also has more extreme slides for guests to enjoy, such as the Funnel of Fear. 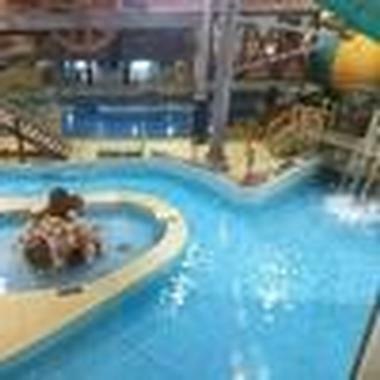 Splash Universe is an indoor waterpark located in the town of Dundee. The massive indoor waterpark features more than 100,000 gallons of water excitement for the entire family. The waterpark resort is open throughout the entire year, offering family experience full of fun any time of the year in Dundee, Michigan. There are plenty of attractions to entertain guests at Splash Adventure, from the Water Adventure Tree House to the thrilling Goldmine Adventure Water Slide. River Raison, the waterpark’s lazy river, provides a relaxing ride down a slow current. There are several other water-filled and fun attractions as well. Waterford Oaks, managed by the Parks and Recreation Department of Oakland County, provides several water attractions for visitors to enjoy during the summer months. The tropical wave pool at the outdoor waterpark features bubbler fountains and palm trees near the pool’s shore. Other attractions at the waterpark include the water playground children with over 30 different interactive features and the park’s group raft ride, which is three stories tall. All of the pools at Waterford Oaks waterpark are heated. There are also concessions, picnic areas, and grills available for guests to use, along with tubes, lounge chairs, and a bathhouse featuring lockers and showers. Seven Peaks Waterpark Duneland in Porter, Indiana, originally started out as a smaller amusement park by the name of Enchanted Forest. The amusement park later closed and then reopened in 1994 as the Splash Down Dunes Water Park, which later closed in 2009 due to a dispute in ownership. The waterpark was later purchased by Seven Peaks and re-opened in 2013 on May 27 under the current name. The waterpark features many different water attractions, including several thrilling water slides, pools, a wave pool, spraygrounds, an area designed just for younger children and families, and more. This wet and wild waterpark centrally situated in the heart of the Boyne Mountain Resort is open year-round, offering the perfect place for families and friends to come visit, have fun, and relax. The always 84-degree indoor waterpark features six thrilling water slides, such as the Big Couloir, the first ProSlide SuperLOOP in Michigan featuring the steepest drop in all the water slide industry. There is also a pool for children, warm hot tubs, the Splasherhorn Mountain, the Rip Zone, a surfing simulator, among several other attractions. 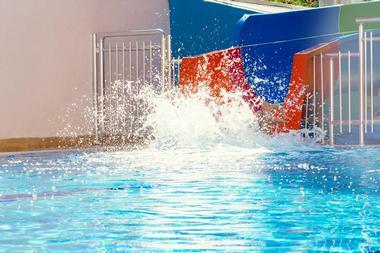 The waterpark is perfect for both cooling off in summer or warming up in winter. 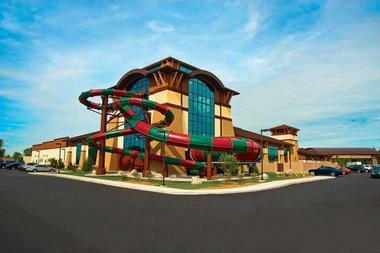 Adventure Bay Family Water Park offers more than 35,000 square feet of exciting water fun for visitors of any age. Among the several water attractions at the park are five thrilling water slides, such as the Whizzard, the Python, and the Master Blaster, the waterpark’s water roller coaster. 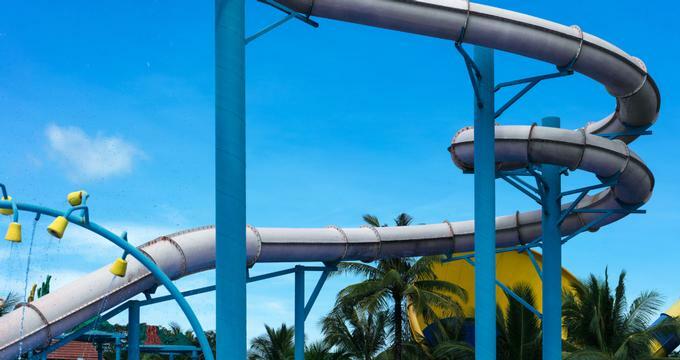 Other attractions at Adventure Bay include the Lazy River, the surf simulator FlowRider, the Wave Pool, Tot Loch slides, the Splash Zone featuring a massive tipping buckets and slides, and an activity pool. Interactive features for water play include water cannons, bungee swings, bubbling jets, tipping cones, and geysers. Jump Island in Brighton, Michigan, is a fun-filled inflatable outdoor waterpark filled with high-energy activities. The waterpark lets visitors slide, jump, and run through rivers, lakes, and beaches. 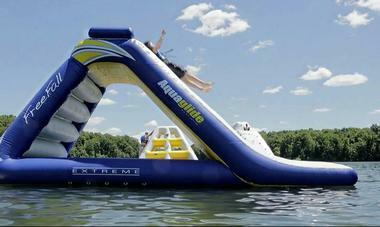 Jump Island offers the most in inflatable fun at the waterpark with plenty of obstacle course challenges as well. The park features the Inflatable Iceberg and inflatable slides measuring 16 feet, along with runways that provide guests with the ability to slide, run, walk, and balance on the water. It’s the perfect destination for people of all ages looking for adventurous, thrilling, and challenging outdoor fun on the water. Gold Rush Waterpark, an indoor waterpark located at Double JJ Resort, features approximately 60,000 square feet of water fun. While the waterpark is more medium-sized compared to other indoor waterparks in the state, it is home to the tallest indoor water slide in western Michigan. The waterpark has an Old West theme and has such attractions as the Thunder Canyon raft ride and Miner’s Plunge. Other attractions at Gold Rush include thrilling water slides, a wave pool, a pool for toddlers, a water fort, both indoor and outdoor hot tubs, water basketball, and a crazy/lazy river. 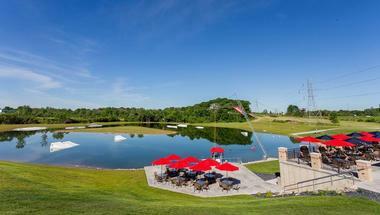 Action Wake Park, located in Hudsonville, Michigan, is the first, as well as the one and only, full-size cable park in the state. The park provides a way for people who don’t have access to boats of their own to enjoy watersports. Action Wake Park offers visitors a chance to learn wakeboarding, kneeboarding, and water skiing within a controlled setting without any need for their own boat. This lets the facility bring the joy and excitement of watersports to an even wider audience. The unique waterpark promises to deliver its guests a premium watersports experience for all skill levels.